With authenticity, integrity, and insight, this collection of poems addresses the many issues confronting first- and second- generation young adult immigrants and refugees, such as cultural and language differences, homesickness, social exclusion, human rights, racism, stereotyping, and questions of identity. Poems by Elizabeth Acevedo, Erika L. Sánchez, Samira Ahmed, Chen Chen, Ocean Vuong, Fatimah Asghar, Carlos Andrés Gómez, Bao Phi, Kaveh Akbar, Hala Alyan, and Ada Limón, among others, encourage readers to honor their roots as well as explore new paths, offering empathy and hope for those who are struggling to overcome discrimination. Many of the struggles immigrant and refugee teens face head-on are also experienced by young people everywhere as they contend with isolation, self-doubt, confusion, and emotional dislocation. 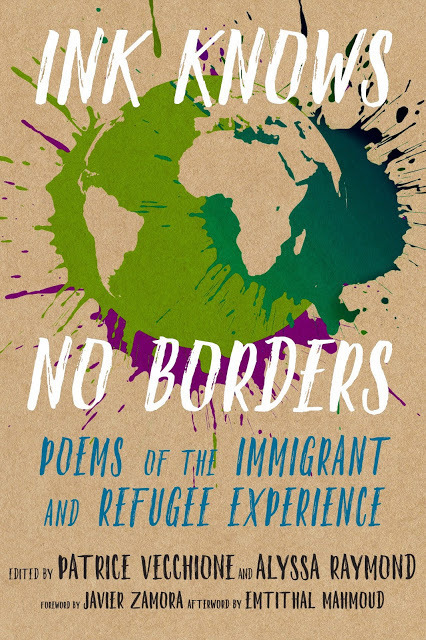 Ink Knows No Borders is the first book of its kind and features 64 poems and a foreword by poet Javier Zamora, who crossed the border, unaccompanied, at the age of nine, and an afterword by Emtithal Mahmoud, World Poetry Slam Champion and Honorary Goodwill Ambassador for UNHCR, the UN Refugee Agency. Brief biographies of the poets are included, as well. It's a hopeful, beautiful, and meaningful book for any reader. Poet, nonfiction writer and teacher Patrice Vecchione has edited several highly acclaimed anthologies for young adults including Truth & Lies, which was named one of the best children's books by School Library Journal, Revenge & Forgiveness, and Faith & Doubt, named a best book of the year for young adults by the American Library Association. She's the author of Writing and the Spiritual Life and Step into Nature: Nurturing Imagination and Spirit in Everyday Life, as well as two collections of poetry. For many years, Vecchione has taught poetry and creative writing to young people (often working with migrant children) through her program, "The Heart of the Word: Poetry and the Imagination." She is also a columnist for her local daily paper, The Monterey Herald, and has published essays on children and poetry for several outlets including the California Library Association Journal. See more at patricevecchione.com.